Thursday's police oversight board meeting brought some clarity on the Hamilton Police version of the controversial "carding" practice in Toronto. Black people are stopped, questioned and documented in police street checks at a disproportionate rate compared to the population in Hamilton, police statistics presented Thursday show. And the information recorded in all such stops is kept indefinitely in a police database. In Hamilton, 11 to 14 per cent of the police street checks were done on black people over the last five years. But only three per cent of the population of Hamilton is black, according to the 2011 Census. In the police statistics, 75 to 80 percent of the street checks every year were done on white people — a finding that Chief Glenn De Caire and board chair Lloyd Ferguson cited as proof the service has no problem with racial bias. But when compared with the percentage of Hamilton's population that is visible minorities, the numbers showed a disproportionate impact. The findings came as part of a report to the police's oversight board, responding to concerns raised that the practice is racially skewed and an infringement on privacy rights. Deputy Chief Eric Girt presented information to the board about its street checks, commonly called carding in Toronto. Girt defined "street checks" as "police engaging with the community members for investigative purposes" and said they work: Information gathered in street checks is helping to solve a current homicide investigation, he said. It was a significant meeting in a long fight for clarity over the practice that involves stopping people who have not necessarily done anything wrong to question them, record their ID and whereabouts, and later enter that information in the police database. "I think this is great information, but I would hope that we kind of take it to the next step and report on and have a discussion about what the value is going forward, in terms of collecting this information, analyzing it, reporting it to the broader community and what the implications are," said Mayor Fred Eisenberger, who sits on the board. Also Thursday, despite months of semantic confusion, Hamilton's "street check" practice was described similarly to Toronto's "carding." Hamilton officers even have a street check "card" they use to fill out a person's name, date of birth, age, names of their "associates" and physical and race identifiers. Girt said the street check form is a piece of paper a little smaller than a recipe card. But Girt would not say that Hamilton's street checks are the same thing as "carding." "You're getting into terminology," he said. "We don't call it carding." Hamilton police also revealed they have have been keeping racial data of people questioned during street stops in the city for five years, but do not analyze it for evidence of bias in their carding practices. The board asked the police to bring back a study on doing this kind of racial analysis on an ongoing basis. It also asked for a report on the best practices other police services boards are adopting as they oversee police forces around the province grappling with similar issues. Girt said the stops are a key policing tool and that police are not happy about the chilling effect of recent public debate about the practice. Where 2010-2013 saw thousands of street checks being filed, the total street checks plummeted to 188 in 2014. "Are we getting to a stage where our officers are inhibited from doing their core functions because of the repercussions they feel may flow from it? That's the fundamental tension," Girt said. 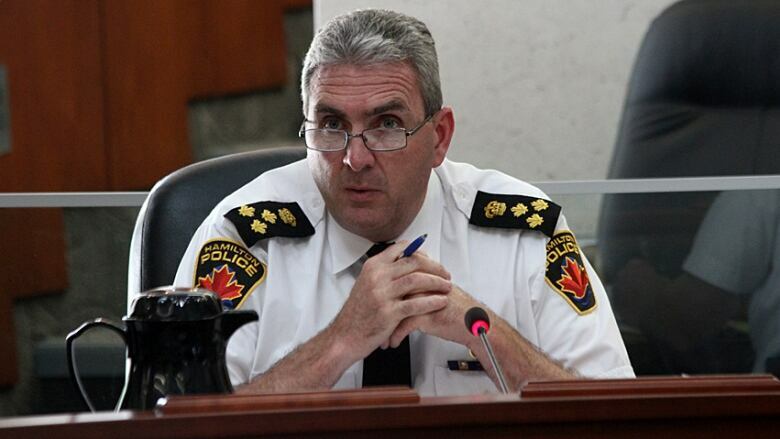 Girt showed statistics that indicate between 20 and 25 per cent of the street checks are done on visible minorities. Hamilton's visible minority population is roughly 15 per cent. But Girt noted that most street checks are done in the downtown area, where the visible minority population is closer to 35 per cent. Girt's numbers were much lower than those counted by the ACTION team in its reports over the past five years. He said that's because duplicate reports on the same stop by different officers were deducted from the counts. The presentation came after months of questioning from advocates who have called for police to end its street check practice and to be more transparent and accountable about who is impacted by proactive policing practices. Girt's presentation cited case law suggesting that while citizens may not have a legal obligation to comply with an officer's questions they have a moral and social duty to. "There may be no legal reason for people to speak to the police, but there is clearly in the law a moral and social obligation to participate in keeping all our communities safe," said Chief De Caire in his concluding remarks. But for the police, he suggested no "moral and social" obligation to tell someone stopped in a street check that he or she has the right to walk away, even though that's something the service has added to its brochure and app this year. "Similarly there's no legal reason to advise people of those rights that are not activated until that arrest and detention threshold is met," he said. That distinction didn't sit well with Desmond Cole, a Toronto-based journalist and activist who has called for the end of carding there. Cole was in Hamilton on Thursday for a community forum on electoral issues. "The Charter prevents arbitrary detention," he said. "All that tells me is that someone that's being arrested has more rights than someone who is walking down the street."